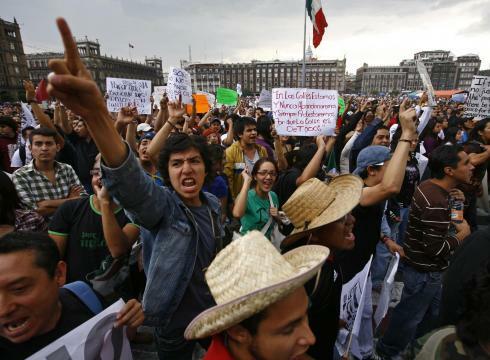 Tens of thousands of people in Mexico City are marching against the result of the presidential election, which was won by Enrique Pena Nieto. The demonstrators, who are not necessarily linked to any particular party, say the vote was not fair. They accuse Enrique Pena Nieto’s party, the PRI, of buying votes; some carried banners saying “Not another fraud”. Enrique Pena Nieto, who was declared the winner after a recount of nearly half the votes, denies the allegation. The second-placed candidate in Mexico’s presidential election, Andres Manuel Lopez Obrador, has said he will mount a legal challenge to the result. Andres Manuel Lopez Obrador said he would prove that illicit money was used to buy votes in the 1 July poll and secure the victory of centrist candidate Enrique Pena Nieto, who denies this. There is a broad spread of people, not necessarily from the left, who feel that votes in their parts of Mexico were tampered with. He accuses the party of Enrique Pena Nieto, the Institutional Revolutionary Party, of paying for votes using gift cards for a supermarket chain. The party governed Mexico for 71 years until it was defeated in the 2000 presidential poll.